An ordinance regarding keeping chickens received some negative feedback at the Sept. 12 Tabernacle Township Committee meeting. Committee unanimously approved the first reading of the ordinance that would create a section entitled “Standards for Keeping Chickens.” Public comment, previously being all positive at the last committee meeting where the ordinance was initially discussed, was mostly against it this time around. Public comment focused on attracting animal predators, coop setback issues, manure management and the future of Tabernacle. “Two weeks ago, (people were all in support). Tonight, we heard some other stories … it is really not as simple an issue as I think I thought it would be. I think the points brought up (tonight) are something we really have to look at and make sure if we do this, we do this well,” Mayor Stephen V. Lee IV said. According to the ordinance, the keeping of chickens promotes healthy food choices, can provide a source of fertilizer for gardening when properly taken care of and provides a family-friendly experience. The ordinance also established the township as having a long-standing agricultural history and rural character. The ordinance would require a permit to keep chickens, prohibit the selling of chickens or chicken by-products, define a minimum lot size of one-half acre, permit chickens only in residential or agricultural use zoning, limit female chickens to nine per property and prohibit roosters or cockerels, and limit structures to provide a fully enclosed shelter with a fenced outside enclosure in the rear yard of the lot located at least 30 feet from any residential structure on an adjoining property. To view the full ordinance as approved on Sept. 12, visit www.townshipoftabernacle-nj.gov/agendas_and_minutes/index.php. Resident Jim Jones expressed his concern about predators. He said since 2008, the coyote population has doubled and become too friendly. According to the state Department of Environmental Protection, Tabernacle has had a frequency of reports from 46 to 75 in the area as of July 1, 2015. “I don’t want to present a smorgasbord to these guys,” Jones said. He, along with other residents, feels coyotes, foxes and even neighborhood dogs could be an issue. He also had concerns about the location of the chicken coops on properties and the ordinance having no information about penalties for not complying with these standards. Fran Brooks, though expressing she supported having chickens, felt things needed to be better defined, such as residential areas and regulations for manure. Lee said part of the reason the committee is approving this now is it will go to the land development board to look at possible set-back and zoning issues. Resident Jason Litowitz said he thought chicken coops would not help with the future of Tabernacle. He said Tabernacle used to be seen as an agricultural community, but he thinks the township should be more focused on attracting families and couples to move in, as enrollment in schools is declining. 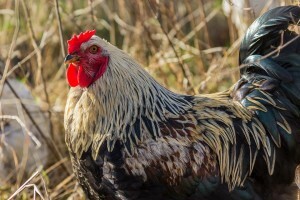 He feels prospective residents who see a chicken coop next door may be averse to moving in, which could have a negative impact on property taxes. “If a family is looking at a house and they see a chicken coop next door, odds are they will be turned away … it will have a negative (impact) on the neighboring property … Not to mention when the state reduces state aid, that would have a major negative impact,” Litowitz said. After the meeting, The Sun reached out to Beth Johnson of the Facebook Group “Backyard Chickens in Tabernacle,” a citizens’ group of 125 members that was instrumental in getting an ordinance for chickens on the committee’s radar. Johnson, working with Nik Stouffer who helped pass a chicken ordinance in Medford, gave a presentation to council with a list of benefits to have backyard chickens, agreeing with what was stated in the ordinance such as the health benefits of fresh eggs, sustainable living with reduced waste and natural fertilizers, and how they are great family pets. Johnson also provided some information from the book “City Chicks” by Pat Foreman, stating the belief that chickens will attract predators is a myth. According to the book, wild bird feeders, pet food, gardens, fish ponds, bird baths and trash waiting to be collected all attract raccoons, foxes, rodents and flies. Modern micro-flock coops, such as chicken tractors, elevated coops and fencing, provide ways of keeping and managing family flocks that eliminate concerns about such pests and predators. “Chickens are educational and fun pets for children. You wouldn’t believe it, but they are great, friendly pets. My friends with children have a great relationship with their chickens. Some of the chickens even do tricks, just like a dog. Also it gives a chance for the kids to participate in the Burlington County Farm Fair where the kids learn to show their hens,” Johnson said. The public hearing and second reading of the ordinance is scheduled for the next committee meeting on Sept. 26 at 7:30 p.m. in Town Hall. 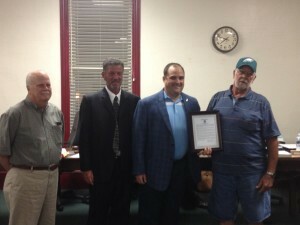 Elwood Parks was given a proclamation for his 43 years of service to Tabernacle. Parks, raised in Tabernacle, was a part of the township’s Public Works team, the Medford Farms Volunteer Fire Company, Tabernacle Rescue Squad, Tabernacle Fire Company №1 and various community organizations. The committee, community, family and friends all spoke highly of Parks. He also received a key to the city, which only one other person has — Clarence Grovatt, who recently turned 100 years old. Editor’s notes: The following article reflects edits from the printed edition Sept. 21 to 27.